It’s been a long time coming, but a Guatemalan judge has ruled that General Efraín Ríos Montt, the military dictator who ruled Guatemala from March 23, 1982 to August 8, 1983, is to stand trial on genocide charges. Ríos Montt was president of Guatemala at the height of that country’s civil war. He is to face charges of crimes against humanity related to the murder of 1,771 indigenous Ixil Maya. He will also be charged with the forced displacement of another 29,000 people, all of them indigenous. The displacement was part of the military’s strategic “scorched earth” campaign, in which the military burnt villages to the ground and committed hundreds of massacres. In total, more than 200,000 civilians lost their lives in the war, which pitted the US-backed dictatorship against Marxist rebels. Guatemala had been under military rule since 1954, when the democratically-elected president Jacobo Árbenz was ousted in a US-backed coup. In December 1982, at the height of the atrocities, US president Ronald Reagan called Montt "a man of great personal integrity" who was "totally dedicated to democracy". The genocide charge against Ríos Montt is based on the findings of the United Nations’ Historical Clarification Commission, which concluded that the war devolved into a deliberate attempt on the part of the military to wipe out Guatemala’s indigenous Maya people. The General has been fighting these accusations for thirty years, and for a 12 year period hid behind prosecutorial immunity as a member of congress. That immunity expired with his term in office, on January 14, 2012, and he has been under house arrest ever since. Now 86 and in failing health, he is the first ex head of state to be charged by a Latin American court. In 1998 a Spanish judge indicted former Chilean dictator General Augusto Pinochet for human rights violations committed during his rule, which resulted in his arrest while visiting England. 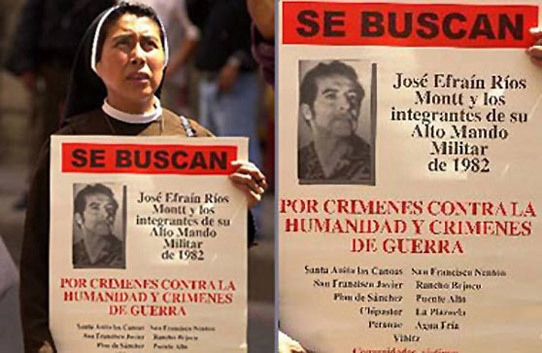 However, he was released and returned to Chile, where he died in 2006. A three judge panel will decide the fate of Ríos Montt and another man, Jose Mauricio Rodriguez, a former military intelligence official.